Update: Obviously, the event has passed. If you missed it, don’t worry: you have two more opportunities next year, on April 4 and September 28, 2015. If you’re able to catch it, and are looking to capture the red-colored moon with your camera, Maui-based photographer Scott Mead has some tips. Mead, one of DT’s go-to expert, was on hand for the last occurrence (Hawaii should get a nice view). We asked him what the experience was like, and how he shot it (which you can see here). What was the previous Blood Moon experience like over in Maui? In a word: Amazing! A good portion of the Island had clear skies, which made for relatively easy viewing from low-lying areas. The die-hards and serious shooters (myself included) went to the summit of Haleakala to view the eclipse. 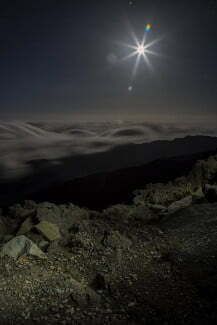 At a tick over 10,000 feet, the lack of environmental pollution and light make it an ideal place for astrophotography. 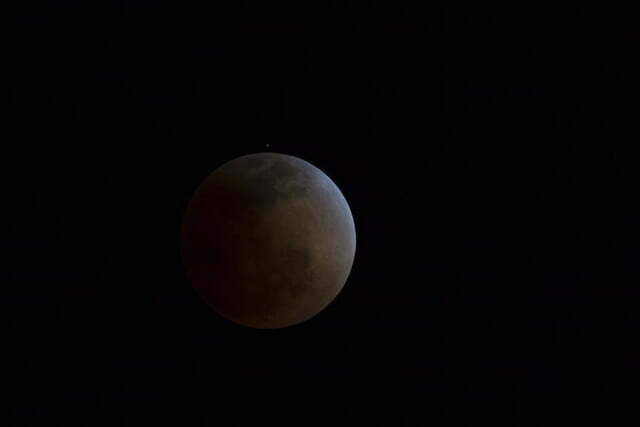 But unlike those who opted to watch the Blood Moon from a balmy beach, those atop the crater were shooting in rather frigid conditions: An ambient temperature of 37-degrees, wind chill of 22-degrees and high winds with 50 miles-per-hour gusts. Did you have to do any prep work beforehand, photo wise? Knowing that the camera would be out in the cold, I had to ensure that the batteries (and spares) were kept warm to minimize drain. I usually keep them out of the camera, tucked in an inner jacket pocket until I’m ready to shoot. Also, pulling the camera out from a well-insulated camera bag (packed at 80-plus degree temperatures) will quickly result in a fogged lens. I always hang my camera (with the lens I intend to shoot with) on the headrest of the back seat, driving to the summit with the back windows down a bit. This allows the body/lens to acclimate to the colder temperatures on the drive up, so I can immediately start shooting if I need to. 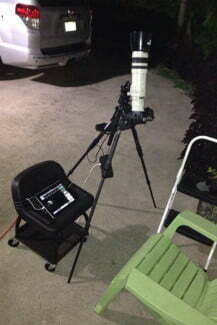 What are some weather conditions that could affect photographing the moon? The biggest issue at that altitude is cloud cover. For the first-half of the eclipse, we had several small clouds at high altitudes that blew through. And although they didn’t obscure the moon, sharpness is certainly affected. We did have thick cloud cover descend on us, which socked us in for a while. You just have to be patient for the skies to (hopefully) clear. 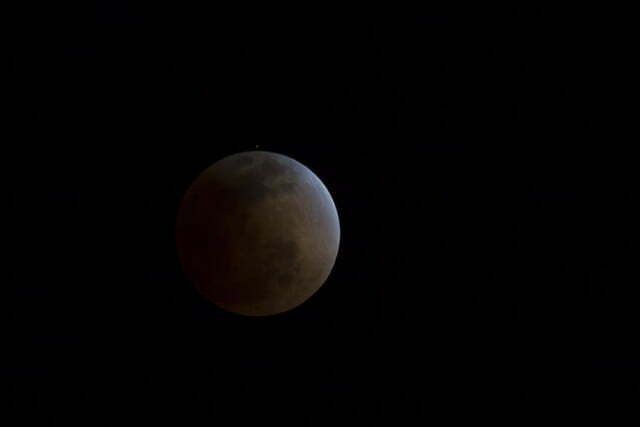 Can you share with us what the best way to capture something like the Blood Moon? What type of lighting condition should you be in (total darkness?)? What’s the best place to shoot something like this? What would be a great lens (or lenses) to use? What camera settings to use? 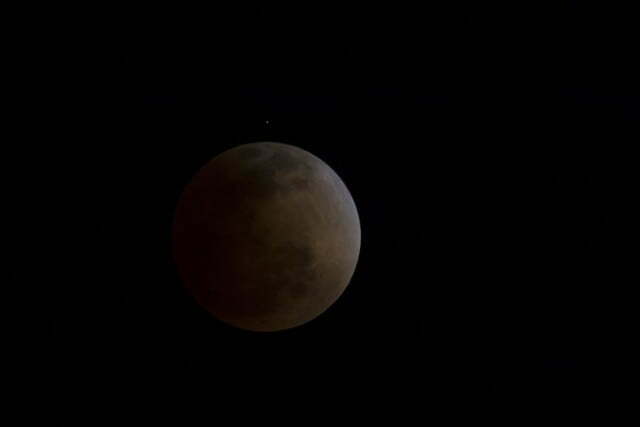 The number of ways to shoot a Blood Moon is only limited by your creativity. While you can shoot from the comfort of your back yard, I like to get high above the light pollution, and away from any light source. You also need to find a location free of wind, as any camera shake will translate into a blurred image. With the blustery conditions we faced atop Haleakala, I tucked the camera out of the wind, beside the Visitor Center building, placed the articulating legs of my Gitzo Explorer tripod into various nooks/crannies of the lava rock, and added a 10-pound weight to the center stalk for maximum stability. I’m always attracted to the details in the lunar surface, so I usually choose to focus in on the moon, and not include any foreground elements. For this shoot, I relied on my Canon EOS 5D Mark III, as well as my Canon 100-400mm f/4.5-5.6L IS lens, coupled to a Canon EF 2x III Extender to give me an 800mm focal length. The Mark III is one of the best cameras for low-light shooting, and you can easily bump the ISO up to 800-plus without objectionable noise. 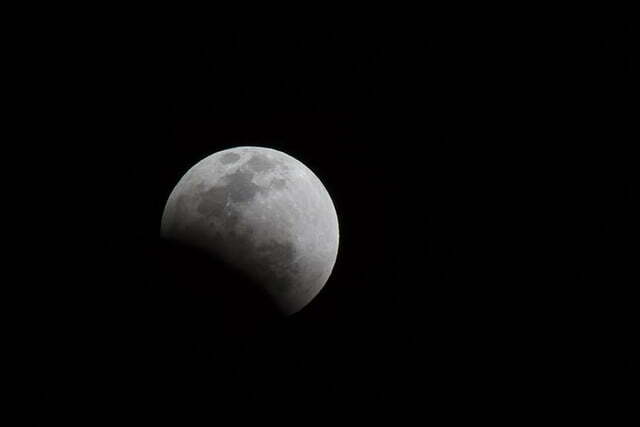 At full eclipse, I was shooting at ISO 800, 800mm at f/11 for 0.4 sec. 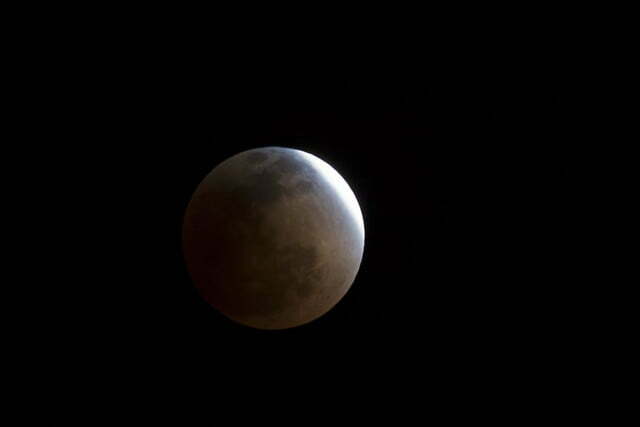 Would you create a time-lapse movie the next time the Blood Moon makes an appearance? How would you go about that? I create time-lapse movies of sunrise/sunset all the time, and in those cases, there’s always nice foreground and background elements to hold the scene, while the sun moves and light changes. To capture a Blood Moon time-lapse, I’d probably piggyback the camera on a telescope with a motorized equatorial mount, or just attach the camera to an iOptron SkyGuider, keeping the moon evolving in place, rather than across the sky. There’s always gonna be that point-and-shoot guy. Is it a loss for him, or is there something cool he could do too? Shooting with a point-and-shoot is never a loss, you have to get creative! No matter what, you’ve got to get the camera out of your hands and onto a sturdy tripod. Most P&Sers have built-in “digital magnification,” so you can blow up the subject by using a smaller portion of the sensor. Of course, this doesn’t give you an optimal image, but you’ll definitely get a good view of the moon. 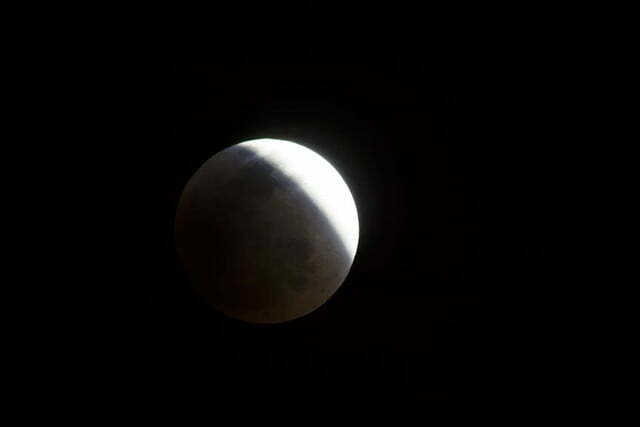 If the exposure is too bright, set the exposure compensation -.7 or -1/stop to gain back detail in the moon’s surface. If your camera has a manual mode, try setting the camera at ISO 200, f/16 at 15-seconds, max out your optical zoom, and be sure to frame the shot with something interesting in the foreground. Place the self-timer on and grab a flashlight. Click the shutter, turn on the light and count to eight. Then paint the foreground with the flashlight to get an image with the moon in the sky and lit foreground for a great perspective shot. Should people even bother with smartphones? Smart phones are great for documenting the “being there” during the eclipse, or getting the “broad view.” But that relative wide field of view, getting the details would be tough, even with clip-on telephoto adapters.